In this tale of a young boy, an old man, and a dauntless pigeon, a lyrical text and extraordinary illustrations offer a gorgeous meditation on loneliness, belonging, and home. A young Italian boy has moved to the Welsh hills with his family. He feels isolated and unhappy, a stranger in a strange land. It is only when he makes an unlikely friend, an old man who lets him fly one of his pigeons in a race, that he learns how he can belong. Nicola Davies’s beautiful story — an immigrant’s tale with powerful resonance in our troubled times — is illustrated by an artist who makes the world anew with every picture. Nicola Davies is the award-winning author of The Promise, also illustrated by Laura Carlin, which received a special honorable mention in the Bologna Ragazzi Award fiction category. Nicola Davies’s many books for children include Outside Your Window: A First Book of Nature, Ice Bear: In the Steps of the Polar Bear, and Big Blue Whale. She lives in Wales. 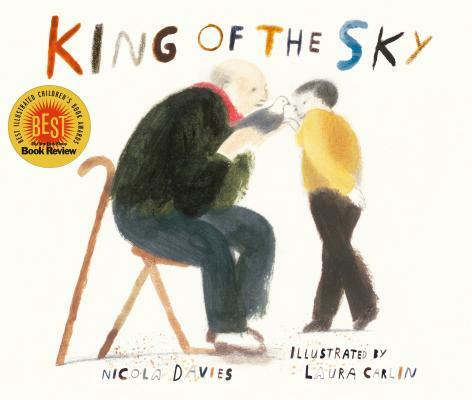 Laura Carlin is the illustrator of The Promise by Nicola Davies as well as The Iron Man by Ted Hughes, which was awarded an honorable mention in the Bologna Ragazzi Award fiction category. Her artwork has been featured in Vogue, the New York Times, and the Guardian. She lives in London. With soft and smudgy yet deliberate mixed-media art that seems at once modern and timeless, Carlin’s warm, nostalgic images find a surprising visual connection between a northern mining region and a sunny southern land. This lovely story will resonate with any child who has felt out of place, whether a transfer student in a new school or an immigrant in a new country. This will work for group readings, but will be much more special for one-on-one sharing, where readers can absorb the language and pore over the detailed, nuanced pictures. This is a unique and very special book. Striking mixed media artwork combined with a timely message for anyone struggling to fit in in a strange and seemingly hostile place make this a strong purchase for large collections and/or curriculums with a global focus. The mixed-media art is soft and smoky and impressionistic, with watercolor blurs evoking pigeons in flight and grainy pencil sometimes adding texture and sometimes outlining figures; they silently expand on the narrator’s account, allowing for views into his family and the bustling life of his terraced row of houses. This is likely to be as much of a different world for viewers as it is for our protagonist, so they’ll appreciate the novice company and find this an unusual and compelling animal story. Carlin’s smudgy, near-transparent mixed-media illustrations, depict- ing soot and sun and shadow, capture the essences of the old and new homelands, and a number of wordless spreads emphasize the differences, and distances, between them. Quiet, tender, and profound, this window into immigration offers an intimate understanding of just what it means to come home. Davies brings the story full-circle in elegant ways, and Laura Carlin’s mixed-media illustrations exhibit the same type of smudgy, scratchy-yet-soft look that won her accolades for The Promise, also written by Davies and published in 2014.